Abstract: 3D printing technology usually aims reproducing objects deterministically designed by 3D CAD tools. However, 3D printing can generate patterns similar to randomized (non-deterministic) 1D or 2D cellular automata (CA). Cheap fused deposition modeling (FDM) 3D printers can be used for this purpose. 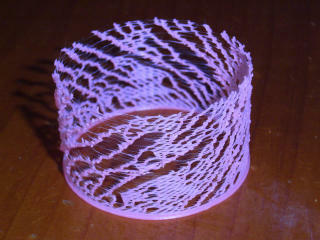 By using an FDM 3D printer, melted plastic filament is extruded by a hot nozzle to shape a 3D object. They can generate CA-like patterns with constant head motion and constant filament extrusion and with unintended fluctuation but no explicit randomness. Because of fluctuation, every time the printer generates a different emergent pattern. This paper proposes a method for printing seaweed-like patterns of 1D and 2D CA using FDM, and computational CA models. This method will open a new horizon of 3D printing applications. This page contains a single entry from the blog posted on January 22, 2014 12:00 AM.